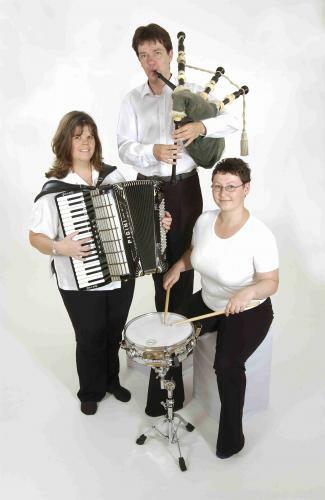 Based in Kinross and Dundee areas,this compact 3 piece ceilidh band includes their own caller - though,if required,the band can be augmented to suit the occasion (see elsewhere). Gail was taught to play accordion by the Late John Huband of Muirhead, near Dundee. She was a longtime member of the Muirhead Accordion Band which performed regularly in the Dundee area, as well as on frequent visits to Ireland. She also played in a duo with John for a while including appearances on BBC Radio Scotland's 'Take The Floor'.Gail's skill at playing for dancing means she has travelled widely with various dance groups. Laura lives in Falkland and has played the drums for many years. Her skilled, imaginative drumming has frequently won her praise and contributes greatly to the unique sound and 'danceability' of the band. Laura is also the band's caller and is an old hand, at getting people up to dance. Neil plays highland, small and border pipes, as well as whistle and guitar. He lives in Inchture and has played at festivals throughout Scotland and beyond as part of various bands. He has also recorded on albums for other musicians.